Is the Wind Turning in Favor of Assad? Current: Is the Wind Turning in Favor of Assad? The Baba Amro district of Homs may now become the turning point in the year-long bloody battle between opposition forces and Syrian President Bashar Assad’s regime. The district became the symbol of resistance after government troops surrounded it with tanks and artillery and shelled it intensively for weeks, killing and wounding civilians and destroying most of its buildings. The withdrawal of the rebels under pressure from government troops on March 1 marked the turning point. Indeed, the withdrawal occurs at a key moment in the uprising against Assad. The Syrian National Council (SNC), the de facto political opposition group unable to hide its many divisions with its mix of Muslim Brothers, secular intellectuals, youth activists and others, witnessed a split among its 270 members. The SNC is already perilously close to losing any credibility with the activists, protesters, and fighters inside Syria, not because it is too hawkish, but because it is not hawkish enough. As a result, on March 1 came the announcement of a splinter group, the Syrian Revolutionary Patriotic Group, led by Haitham al-Maleh, a former judge who has been in and out of Syrian prisons for decades. Beyond the recent split in the ranks of the SNC, the lack of unity of the opposition forces is also unlikely to entice the many Syrians who are fearful of the post-Assad reality. The Interior Ministry announced that Syrians had approved a new constitution with 89.4% backing the measure. As for the West, led by France, the UK and the U.S., it is still contemplating ways out of the crisis with no real solution, given the Russian and Chinese position that has repeatedly spared Assad from meaningful sanctions. The timing of the announcement of the new group is unfortunate, to say the least. As calls mount to arm the FSA, the need for political oversight of any arms supplies is likely to be a key condition for such a move. General Martin Dempsey, chairman of the U.S. Joint Chiefs of Staff, said it was untimely to consider arming the rebels “because I would challenge anyone to clearly identify for me the opposition movement in Syria at this point.” He was referring to the armed groups on the ground. The same question could be asked of the political opposition. In this context, one might be tempted to ask what would have become of Assad without Russian and Chinese support? The other pertinent question would be why the Russians are so intransigent in their position and so supportive of Assad in spite of the daily massacres committed against his own people? Looking at the first question, one can definitely divide the period: before the Russian and Chinese veto at the Security Council, and after it. 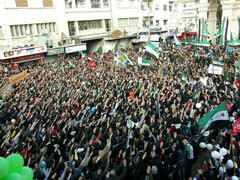 Up until the veto, the FSA was on the ascendancy and it seemed that the wind was behind its sails. Its actions were getting closer to the center of power in Damascus, its ranks were being filled with new recruits, and the number of fighting battalions was getting bigger day after day. The FSA seemed to become a pole of attraction for numerous defectors from the regular army loyal to Assad, as well as for “newcomers” from abroad, mainly fighters from Libya who had fought Muammar Gaddafi after having spent years in Afghanistan. Rumors of al-Qaeda being involved with the FSA circulated, while money and weapons came from Qatar and Saudi Arabia, using the Sunni north of Lebanon as a transit area into Syria. Ayman al-Zawahiri had called on “Muslim” nations to join the battle against Assad. Turkey itself ignored the flow of volunteers coming from abroad who used its territory as a first leg before infiltrating into Syria. There were also reports about CIA and MI5 agents present on the ground, assisting the FSA in its fight against the regime or training new recruits in the martial arts. The hesitant Assad could not have hoped for more. He interpreted the veto at the UN Security Council as a license to proceed and quell the resistance against his regime at all costs. Not coincidentally, Assad chose Homs (the bastion of the Muslim Brothers in the north) to become the example to those who rebelled against him. The destruction left behind after the withdrawal of the rebels from the Baba Amro district and the number of casualties and loss of life should serve as a lesson to other areas in Syria. Having no real sanctions, Assad feels free to go further. From his point of view, there is no going back; he is on his way with no way to return. He has nothing to lose and everything to gain if he subdues his opposition, no matter what the human cost. Russian policymakers tend to stress the double language of the West. Just as it was pressing Assad to resign, the U.S. State Department raised a ban on military aid to President Islam Karimov in Uzbekistan, which had butchered its own protesters a few years earlier. (Uzbekistan is important for supply lines to NATO troops in Afghanistan.) Neither did the U.S. ask King Hamad bin Isa Al Khalifa of Bahrain – where the U.S. Navy has its home in the Persian Gulf – to step down after he crushed popular demonstrations in his capital. Beyond commercial and strategic interests, Russia’s greatest fear is of instability in the Middle East and Central Asia. Russian policymakers already worry about the northward spread of Islamic fundamentalism and the opium trade if the departure of NATO from Afghanistan leads the Taliban to power. At this particular moment the Russians believe Assad still has a chance of survival and to subdue his adversaries. Until they are proven wrong, it does not seem that there will be a change in the Russian position.